Epoxies tend to be stronger than other resins, certainly much less brittle on their own than polyester .. in other words, they have very good flexural strength! They come as two parts which are commonly mixed in ratios ranging 2:1-4:1 resin to hardener by weight. Also compared to others, epoxy resin generally has a very long pot-life (working time) i.e. even a ‘fast’ epoxy resin will still give c.15mins working time before it starts gelling whereas a regular/slow can take 100mins or more (the average would seem to be 40mins). A ‘fast’ epoxy may be demouldable in 8hrs and sandable after 12-18 hrs whereas a ‘slow’ may need 30hrs before it can be removed from the mould. Full cure generally takes 5-7 days. The density is on average like polyester resin SG 1.1 (the weight in grams of 1 cubic centimetre of mixed resin). Viscosity is generally higher than other resins (i.e. its usually a thicker liquid) with an mPas of 1000-1400 being considered ‘medium’ for epoxy. The thinnest I’ve come across so far has a viscosity of 600 mPas .. compare this with polyurethane resins which can be as little as 50 mPas. They are also much more adhesive (hence their modification as epoxy glues). They are usually more transparent and cleaner looking than many general-purpose polyesters. However, water-clear epoxies specifically for solid casting are not common, presumably due to the high risk of excessive heat build-up .. the water-clear epoxies commonly available are almost always just for laminating or coating. There are a great many varieties, but most share a relatively long pot-life and cure time compared to other resins. Epoxy resin is just as commonly used as polyester for the binding resin in fiberglass work but because epoxy is more expensive this applies more to industrial applications. In terms of working conditions, epoxy is almost odourless compared to polyester resins.. though this shouldn’t fool anyone into thinking that good ventilation is not as important! Often resins marketed for sculpture purposes are tagged as ‘not Lloyds approved’ meaning they may not have the structural integrity or moisture resistance necessary for boat-building but are fine for sculpture. This works to advantage because they are often cheaper. Uncured epoxy can be cleaned up with acetone, cellulose thinners or methylated spirit. You may see the term ‘infusion resin’ applied to standard laminating resin. This simply means that the resin is of a suitably low viscosity to be used for vacuum infusion .. which is a process whereby instead of being brushed on resin is sucked into the reinforcement material under pressure. This eliminates the air pockets which may occur using brush-on methods and ensures stronger fibreglass. Because of its flexural strength it is ideal for the laminating or casting of load-bearing forms or those which will be subjected to stress. Many epoxies also have enhanced moisture or chemical resistance making them preferable for exterior sculpture (but see below re. UV exposure). Because of epoxy’s adhesive qualities, good ‘wetting’ properties, the relatively long pot-life before it starts gelling and its toughness.. it is considered ideal for coating or laminating. It is a common constituent in special paint finishes; for the home-practitioner the longer working time makes it ideal if you want to mix your own resin paints. Re. the above qualities, the resin can just be used as an adhesive and it has very good gap-filling properties when combined with fillers. Most epoxies will bond wood, metal and even quite a few plastics. For example it will usually bond with any plastic affected by acetone. Epoxy will bond well to cured polyester fiberglass but polyester won’t return the favour on epoxy. As with anything, if you’re serious, and you want to learn properly for yourself ..do a test first. Epoxy is more adhesive than polyester or polyurethane because it is able to form bonds with the substrate (the material being glued) at atomic level whereas other resins can only bond mechanically i.e. by gripping tightly. Epoxies do not attack polystyrene, so may be an ideal choice for coating polystyrene or styrofoam forms. Epoxy will take a variety of fillers, basically anything inert and free of moisture.. talc, Fillite, marble dust, metal powders etc. I’ve read that powdered/dried ‘ball clay’ mixed into epoxy will even make a good, clay-like putty. Because of the generous working-time it’s practical to mix resin with hardener first before adding filler .. this is usually advised with epoxy. This has an advantage because it means that the consistency can be judged as one’s adding. Like both polyester or polyurethane resin, most of the epoxy resins available for home use need no special pre-warming in order to cure when mixed and will do so at normal room temperature i.e. c. 20C. Most however allow ‘post curing’, that is, accelerating the cure by heating at a moderate temperature for a number of hours. The resin component has a much longer shelf life compared to other resins .. sometimes up to 3 years, although the manufacturers are usually bound to define it as 1 year. This is partly because the hardener part is more active, with a shorter shelf life. Apparently though, there are stories of unopened epoxies being discovered after decades and working ok! Fully cured epoxy can be softened by heating to a temperature over 200F i.e. with a heat gun, but this should only be done in a well ventilated room. As one should expect, one pays for the advantage of a long pot-life by having to wait much longer for the cure and, as mentioned, with some it could be a couple of days before the cast can be safely demoulded. It also means that epoxy is not so suitable for ‘slush’ or ‘rotocasting’ methods especially by hand, unless you want to sit there doing it for more than an hour! The resin itself doesn’t present quite the same health & safety issues as polyester and is considered little more than a possible irritant to eyes and skin. However, the hardener part is a different matter! It is classed as ‘corrosive’ and could be very unpleasant if it gets on the skin. It is also harmful by inhalation. Precautions need to be taken against skin contact and, as with all resins, good ventilation is essential! In price epoxy resins average a little more expensive than polyurethanes, but a lot more than the cheapest polyesters (see example prices below). Epoxy resins are pretty unforgiving when the mix is even a little bit out, for example the Technical Data Sheet for DX020 from Tomps states ‘The components should be measured to an accuracy of 2% or better’ .. in other words, more than 98% accurate! This can only be done by weight .. not recommended by volume! It also means that it’s not a good idea to measure out portions in separate cups and then decant one into the other when ready, because even the slight amount adhering to the cup could make a difference. Mixing needs to be obsessively thorough! .. not forgetting the sides or the bottom of the mixing vessel. When mixing silicone rubber thoroughly I usually recommend spending at least 3mins to be sure, and I would say the same for epoxy. Often it’s wise to transfer a thoroughly mixed batch into another vessel and mix again to avoid unmixed residues on the sides or bottom of the cup. There are often warnings accompanying epoxy resins that thick layers .. especially massed volumes.. will become very hot during cure, causing increased shrinkage. Many epoxies are labelled as ‘laminating resin’ which often (though not always) means that they are not suitable for cast volumes. I’ve read the advice that, if smoke starts rising from curing epoxy ‘it’s likely that the epoxy is damaged and should be replaced’ .. and I would add that it should be swiftly but calmly taken outside! To avoid this happening, large and solid castings therefore need to be done in stages which, because of the long pot-life, can become a lengthy process! Although one presumably doesn’t have to wait each time until the layer is cured, I’m assuming it makes sense to wait until it’s at least cooled down but even this can take a while! West System recommends layers of not more than 12mm when working with their epoxies. There is usually no danger of excessive heat build-up or shrinkage when laminating thin layers with a reinforcement in the standard way. Even the low viscosity epoxy types are considerably thicker than some polyurethane casting resins, so they are not a good choice for intricate castings. On the other hand, if the moulds are 1-piece and open the long pot-life gives a lot of time to pour and coax the resin to fill an involved shape. But partly as a result of higher viscosity, many small air bubbles are generated while mixing and these are persistent! Usually the extended pot-life allows taking the time to deal with these i.e. by skimming away, or passing a hair-dryer or heat gun over the top surface which will eliminate many. Bear in mind though that any heat applied will reduce the pot-life, though this will not be a dramatic reduction. Pouring the resin into an enclosed mould needs to be done very slowly and carefully! 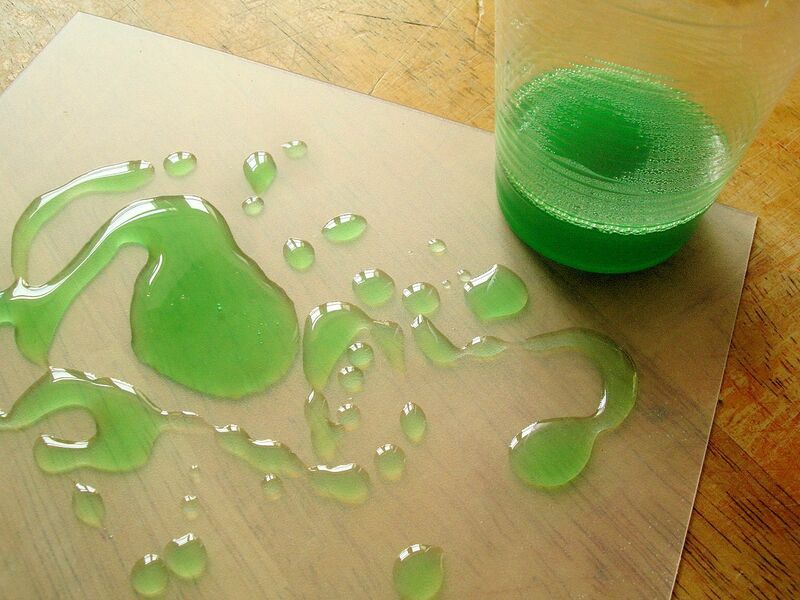 Another problem involving bubbles occurs when using epoxy for coating a porous surface such as foam or wood. As the epoxy heats itself while curing this will expand the air underneath it, forcing it out to form bubbles in the resin. The only solution is to make sure that the original surface is completely sealed first. One way is to prime the surface first with a very thin coat of resin and let this set firm before applying a thicker coat. Epoxies are particularly susceptible to prolonged UV exposure. For this reason when used in boat-building they are more often employed for the inner structure rather than the outer surface. Sunlight doesn’t just discolour epoxy, it degrades it. Deterioration due to UV is known as ‘chalk out’ in the case of epoxy paints or coatings. The usual fix is to coat with a ‘2k’ UV resistant varnish although I’ve read that this doesn’t solve the problem completely. Although epoxy is ideal for fibreglassing there are some notable differences in method compared to polyester work. The major one is .. with the polyester resin I use for fibreglassing work (Tiranti’s GP) it doesn’t matter if one layer has been left to become fully hard before the next is applied. The second layer will bond firmly to the first, and I’ve certainly never experienced any instances of layers ‘delaminating’, that is, coming apart because of time intervals. Most of the guidance when using epoxy suggests the contrary. Layers should be applied while the first layer is still in the so-called ‘green stage’, meaning that although it may feel touch-dry it should still be possible to make an impression with the fingernail. Any later and the fresh epoxy will no longer be able to chemically link with it. In this event the hard epoxy surface needs to be sanded then dusted/cleaned, to at least ensure a good mechanical bond. Another difference is that whereas with polyester resin one can compensate for certain conditions simply by varying the catalyst dosage i.e. according to the volume of resin being used, the addition of fillers or the ambient workplace temperature .. with epoxy this is not possible because resin and hardener must always be mixed according to the set ratio. The only ways to compensate are either to have the choice of either a slower or faster hardener on hand to use, or to apply external heat while mixing or curing. Here are my test notes from 25/5/2015, testing Polyfibre’s EL68 resin with EHA57 hardener (not the one imaged above). The mix ratio was an easy one.. 2:1 resin/hardener. The product is +14 months old (bought March 2014 and unopened). A little, approx. 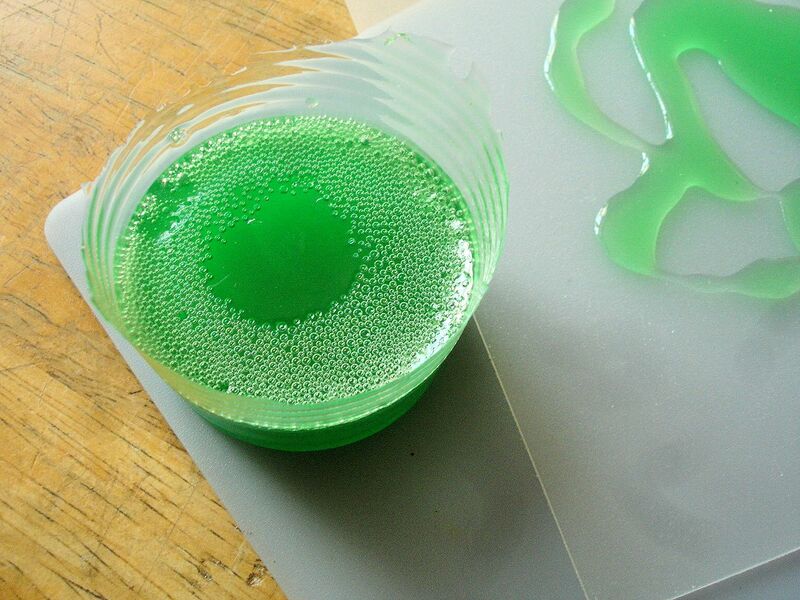 1g, poured in plastic cup then tiny amount of green powder pigment mixed in.. appearing to mix well. Topped up to 20g resin, then colour thoroughly mixed in again. Profuse creation of air bubbles! 10g hardener added and mixed together. Material is colourless compared to my usual GP polyester resin.. clear, though not quite water-clear. No noticeable smell. I left most of the resin left in the cup but I trickled some onto a polypropylene sheet to see how the resin would cure in small/thin amounts and to test whether polypropylene would be a good ‘releasing’ base. Surprisingly, no evidence of heat reaction for a long time, very mild heat felt from the bottom of the cup at 35mins. After 45mins mix is much thicker but may still be spreadable .. stronger heat from cup but by no means excessive. After 60mins firm gel in cup but the thin ‘spills’ on polypropylene sheet are still sticky like clear ‘honey’. After 90mins almost fingernail hard at cup centre but still soft at edges and flat spills are still unchanged. Returned to at 7.30 a.m. the next morning (16hrs). Both pot and pools touch-dry and hard, no surface tackiness even on thin residue lining the mixing cup. On demoulding the cup contents the resin parted easily and cleanly, with complete surface reproduction, though it gripped noticeably more than polyurethane or polyester. There was a small area of tackiness around the rim of the cast piece (bottom of the cup) which could be due to not mixing 100% thoroughly .. even though I was consciously much more thorough than I normally am when mixing PU or polyester! The thin residue lining the cup above the mass came away intact with the casting and was strong but very flexible, no brittleness. The pigment colour was completely even with no grain. The ‘spills’ on the polypropylene sheet were touch-hard and firm, with a beautifully smooth, polished-look surface showing no sign of pitting or clouding. But they would not detach even on extreme flexing of the sheet, remaining flexible. An attempt to prise up a small area with the tip of a scalpel blade merely curled and damaged the resin though it did detach. For the moment the resin is effectively stuck fast and I will have to wait longer before I try again. After another day the resin ‘spills’ were no easier to detach. By getting a blade underneath the pieces could be popped off, but not easily. It shows the adhesive strength of epoxy because even superglue fails to cling as well to polypropylene! Epoxy is supposed not to be able to establish a bond though with plastics which are impervious to acetone, of which polypropylene is one. If I ever use polypropylene as a ‘releasing’ base for epoxy work I will have to remember to spray with a release agent i.e. pva (polyvinyl alcohol) or possibly hairspray (as I’ve heard). Apart from this the two other most significant results were the lack of expected heat from the resin mass .. although small the piece is 2cm thick and av. 4.7cm across .. and the bubbles! I purposely left them unattended to in the cup to see whether they would pop of their own accord, which they didn’t. On the plus side though, they all rose to the surface. There were bubbles initially in the ‘spills’ but most of these could be forced out by ‘tamping’ i.e. jolting or shaking the sheet. I had to pop the remaining few with a cocktail stick. As for the lack of heat, it may be due to the hardener part being a little past its shelf-life although the resin part is relatively inert and should be fine. Unfortunately I can’t check the results against technical guidance or MSDS since Polyfibre doesn’t provide either! What was it about 1936? This was the same year that the first proper patents for both glass fibre and polyester resin were independently recorded! Careful heating with hair-dryer or heat gun over the open surface of the mixed or curing resin. The heat source should not be too close, in the case of a heat gun about 30cm away. Another method is to put some methylated spirit in a small ‘mistifier’ bottle and spray a fine mist on the surface. The alcohol doesn’t adversely affect the resin and evaporates quickly, but acts long enough to reduce the surface tension and pop the air bubbles. Thinning the resin itself could help a lot in the elimination of air bubbles when mixing. It can also help the resin to better impregnate a surface if the resin is being used as a coating, or to make it flow better into a complicated form. Apparently there are a number of ways of doing it, though I can’t vouch for them because I haven’t tried them myself. One method is to heat the resin! 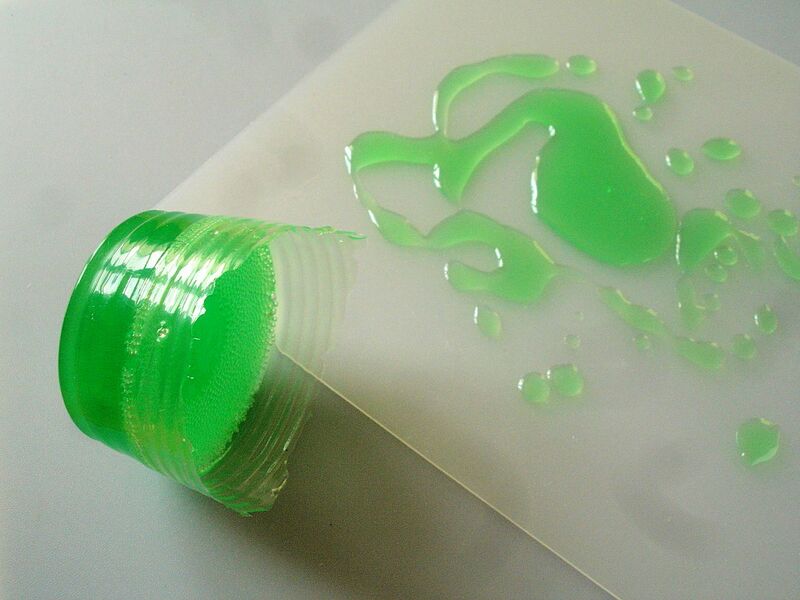 Epoxy changes viscosity, becoming thinner when it’s warmed. The recommended method is to heat up the two parts separately (whichever way you prefer .. but standing the cups in hot water would probably be best) and then mix them. As always, bear in mind that heating will reduce the working time and accelerate the cure. Note also that if using two cups for dosing the resin initially, once warmed both should be decanted into a third cup for mixing together to maintain the ratio. I noted from one info source that the temp should not exceed 115F (46C). I wouldn’t imagine that it’s a very good idea to heat it if you’re pouring a massed volume anyway though, because it increases the risk of the resin overheating with its own exotherm .. if one actually does have to be as careful as they say! Works well with epoxy and the surface is not too hard to be successfully ‘cut back’ or buffed with steel wool. Apparently olive oil can be used to give an even patina. EL68 resin/EHA57 hardener £26.04 per 1.5kg (1kg resin, 500g hardener. Specialplasters 5/2015) Specialplasters describes this as ‘a low viscosity epoxy resin for laminating and casting’. Mix ratio 2:1 resin/hardener by weight. Manufactured by Polyfibre. The hardener is described as ‘fast curing’; EL68 is a Bisphenol F type epoxy (Bisphenol F epoxies generally have a lower viscosity and greater chemical resistance once cured). Polyfibre do not currently offer an MSDS or further tech data on their website! 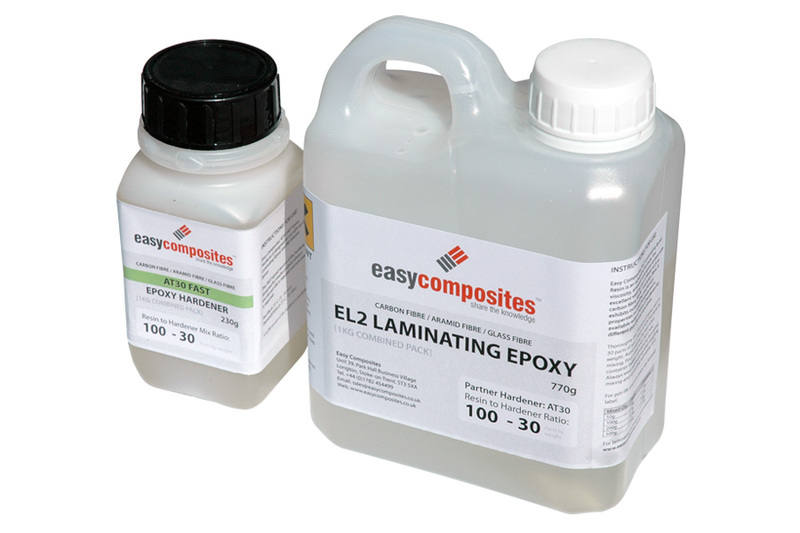 EL2 Laminating Epoxy £20.10 per 1kg (770g resin, 230g hardener), £65.93 per 5kg (Easycomposites 5/2017). A choice of hardener is offered; fast (12-17mins pot-life) or slow (95-115mins). Mix ratio 100:30 resin/hardener; medium viscosity when combined 1000-1400 mpas; clear; SG when combined 1.05-1.15. Easycomposites advises that applying it over 1mm thick in one pour could result in too much heat build-up unless the slow hardener is used in which case 5mm should be possible. DX020 £29.10 per 1.5kg (1kg resin, 500g hardener.Tomps 5/2017) Also described as a low viscosity laminating and casting resin. Pot-life 75-90mins; demould time 2hrs; Shore D 80-90 hardness after 5days cure. Manufactured by Atlas Polymers. Epovoss Glosscoat £39.43 per 1kg (Tiranti 5/2017) from the website page: ‘A general purpose clear epoxy resin for casting, embedding, cold enameling and coating. The resin is very slightly straw coloured, but this is virtually unnoticeable in coating applications. Epoxy resin cures with a nontacky surface, is self levelling, nonshrinking and will adhere to most surfaces. Polyester Pigments may be used with this resin (5% maximum), and also a whole range of fillers.’ Mixing ratio 100:40 resin/hardener; pot-life 30mins; SG c.1.1; demould 12hrs. How does one get epoxy to crack. I saw a coffee table joined together with segments of burl wood leaving open areas here and there that were filled with epoxy (I assume it was epoxy). The resin was cracked through some unknown process to me and it looked like jeweled ice chips. Do you know how to get that effect? I would suppose they might have used chipped glass, but I don’t think so due to overall look of it. I could be wrong, but I sure would like to know how to do it. There’s a picture of it on “I Love Woodworking” on facebook. I can’t seem to figure out how to transcribe the pic here. No way of finding the photo without a link I’m afraid. Anyway, I’ve no idea how this might be done, short of some form of heat application while curing.